Here’s a little bit of instant sunshine in your day. 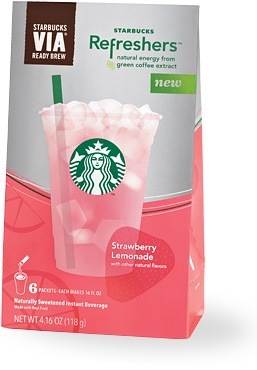 Now you can bring that summery feeling anywhere your travels take you, because Strawberry Lemonade Starbucks VIA Refreshers™ instant beverage is ready to go. With sweet strawberry and lemonade flavors, this is the essence of lazy afternoons, hammocks and idle lawn mowers – even if you’re surrounded by cubicle walls or concrete. The Green Coffee Extract adds an invigorating boost of natural energy yet it tastes nothing like coffee. And it’s fortified with three B vitamins and Vitamin C with less than 60 calories per serving.